The minutes of the Federal Open Market Committee meeting on November 2-3 were recently released. Buried in the fine print was the revelation that the members of the Committee had held a secret video conference on October 15, 2010. A number of points were discussed to clear the way for what would be announced on November 3. The $600 billion inflation of the US money supply (otherwise known as quantitative easing) was favored over another plan that might have led to the Fed purchasing as much Treasury debt as would be required to keep the 10-year Treasury Note interest rate at 2.5%. 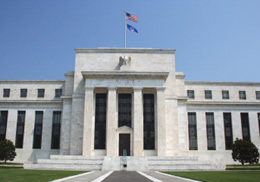 In effect, the Fed considered a possible plan that could have required it to purchase an unlimited amount of Treasury debt. Other subjects of the meeting were whether Fed Chair Ben Bernanke should start holding regular press briefings and whether the Fed should adopt a specific numerical inflation target. Also in the meeting, the Committee members agreed to reduce growth forecasts and increase unemployment projections. There are significant implications about the occurrence of this secret meeting. The regular FOMC meeting schedule is published well in advance. For the Committee to consider it necessary to hold an extra meeting is a scary sign that the US economy may be deteriorating out of control. Then, for such a meeting to be kept secret for a month, sends an even stronger indicator that the US economy and government is in dire straits. The basic message about the occurrence of the extra meeting and that it was conducted secretly is that matters are looking even worse for the US government than they are letting on. That almost certain portends bad news for the value of the US dollar—leading to just one more reason to get out of paper and own some gold and silver.